Well this week I was able to put up the Christmas tree, string the outdoor lights and put out my nativity scene for the upcoming Christmas season. Yet one thing that always makes the season more enjoyable is the music of this wonderful holiday. We in Toronto are quit fortunate to have a radio station (CHFI 98.1 FM) that plays Christmas music all day long. They started last weekend at the beginning of the Santa Claus parade and will continue until December 26, Boxing Day. Christmas music has always been a big part of Christmas for me. I think because I use to play in several bands and we were always playing the songs for about a month and half before Christmas to help us prepare for our concerts. However, about 10 years ago I discovered some alternate Christmas songs that I have to listen to that makes my Christmas complete. They are a collection of songs preformed by Bob Rivers and once I heard them, Christmas hasn’t been the same. For some reason these songs connected with me. Perhaps it’s because I find that with everyone is running around trying to get things done, buy stuff and it places a lot of stress on people when there shouldn’t be. I think people need to not take things too seriously. Everywhere people are worried about getting the perfect gift, have the perfect dinner and the perfect tree. These songs help me to see that there is some fun and laughter in this season. We do not need to take things too seriously; relax, enjoy life, laugh and have fun. Those are some of the important parts of Christmas. Therefore in the spirit of bringing some laughter and fun back into Christmas, I have attached a YouTube video/song of my favourite alternate Christmas song by Bob Rivers. The tone is from the song “Winter Wonderland” but the lyrics have been changed into a new song entitled, “Walkin’ ‘Round In Women’s Underwear”. I hope you enjoy it as much as I do and remember to have a little laugh every once in a while. Inspiration and Imagination, something every artist needs and is elusive as an island of tranquility in a sea of chaos. Many people have told me that I inspire the children and people in general with what I do. Whether creating art, playing baseball or trying to improve my life, people say that I have inspired others to try new things and look inside themselves. I have always found this interesting because I get my inspiration from these very people. A prime example is when I drew the staff at my school as cartoon characters or caricatures for their Christmas Cards. It took quit a while to create the caricatures but once the staff received them they loved the cards and caricatures. In the next few weeks I will be posting a few of the characters from the cards because these people inspired me to create these characters. Hopefully they can spur imagination and inspire others. In the Final Portrait 01, I gathered all the caricatures for a staff portrait. Those were people whom I worked with in the after school program. In this second portrait I collected all the staff I worked with during school hours. I created two of the caricatures around Christmas at the same time as I created the other caricatures, yet the three others standing closest to my caricature; I decided to create as part of their graduation celebration. They were the teachers of the graduating class and I thought a nice gesture to create a Steampunk caricature to commemorate the occasion. Instead of creating a new background I thought it was fitting to use the original I used for the other portrait. I found a great scene of some buildings along the River Seine and I drew a metal platform with stairs that you would use to get onto a ship. I have always loved ships and I was thinking that this group might be going a voyage. I am the Captain after all and what is a captain without a ship to command. Yet I did not want to use any ship, no. 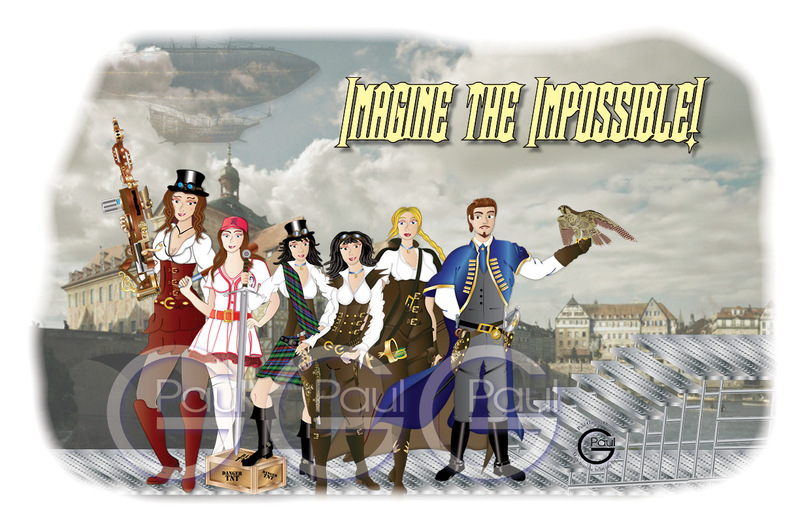 In the Steampunk style I imagined us waiting to board a dirigible. An airship with a massive balloon carrying an old sailing Man-o-War, like the HMS Victory. If you look in the upper left hand corner of the image you can see one flying into view. With these people I did give them a portrait but not with all six of us in it. There were two different portraits but I decided to combine these caricatures into one portrait. They all loved their final portraits and I hope will enjoy this Final Portrait 02 of “Imagine the Impossible”. In the final image I gathered all the caricatures for a staff portrait. This is set in a Steampunk style therefore I needed a Victorian Era background. I went through a few ideas, a garden scene, a drawing-room similar to something from Pride and Prejudice, a steamship (I do like ships) or a busy street in London. I thought long and hard and I wanted something that would inspire some imagination something fanciful but still had a sense of reality. Then I thought of the time I dressed up as a musketeer and the scene came to me. Why should my setting be in London, why not in Paris? Therefore I found a great scene of some buildings along the River Seine and I drew a metal platform with stairs that you would use to get onto a ship. I have always loved ships and I was thinking that this group might be going a voyage. I am the Captain after all and what is a captain without a ship to command. Yet I did not want to use any ship, no. In the Steampunk style I imagined us waiting to board a dirigible. An airship with a massive balloon carrying an old sailing Man-o-War, like the HMS Victory. If you look in the upper left hand corner of the image you can see on flying into view. This is the first group of educators I made the portrait and caricatures for. We went out for Christmas dinner and after I gave the staff their individual cards with their caricatures, I presented this final portrait to them all. They were all signed and dated and to say that they liked it would be an understatement. They all loved the final portrait and I hope you too will enjoy the final portrait of “Imagine the Impossible”. 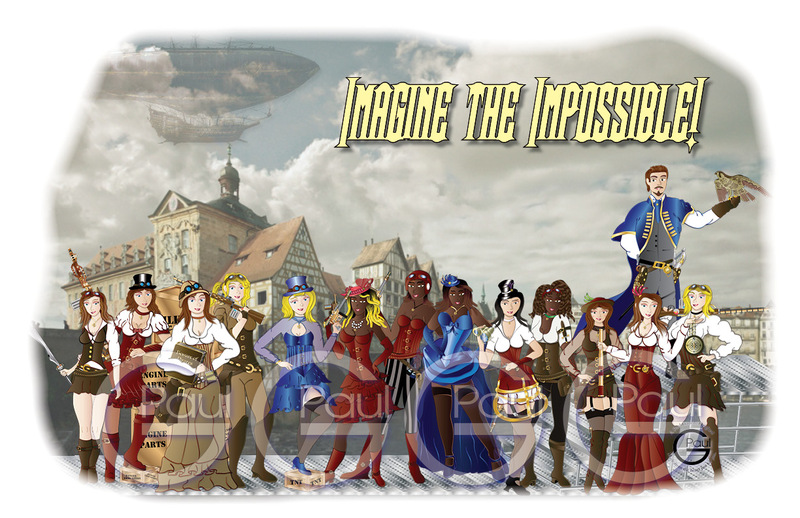 The last caricature of “Imagine the Impossible” is, me. After creating all the staff caricatures I also had to create mine. Yet I had already created one and I could not improve on what I had already created. I had created it as character in a story I had started about a year earlier, “The Captain and the Baroness”. This is a story I created for someone special as a birthday present, but I decided to continue the story line. I was going through some difficult issues at the time and indulging in my creative side helped me through it. The story was loosely reflecting the issues in my own life and when I wrote chapter three I was going through a lot of changes in my life. Therefore I decided to change the look of the ‘The Captain’ character in the story. The original character was my caricature of myself dressed as a pirate, aka Jack Sparrow. So I changed the look of the character and my new caricature was created. I began by basing his outfit with that of a naval officer during the Victorian Era. He is a captain after all so it made sense. I drew him with grey pants and vest, a royal blue jacket overcoat with gold trim and a white pouf shirt. I added a royal blue Ascot tie and black riding boots. This caricature is in the Steampunk style; therefore I drew two holsters with side arms. I added a small dagger to his right and a sabre on the left with a couple of belts. If you look closely, the sabre guard has an inverted engraved image on it, a falcon. I am Maltese and adding a falcon created the idea that my caricature is the Maltese Falcon. 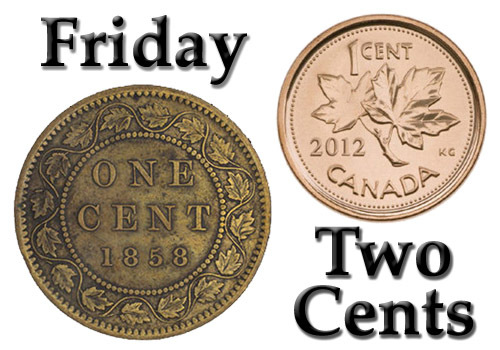 The last touch on the outfit was a pocket watch hanging from his belt. It makes sense; a captain needs a watch to help navigate. The hair, beard and mustache (Van Dyke), were very similar to my hair beard and mustache I had grown at the time. 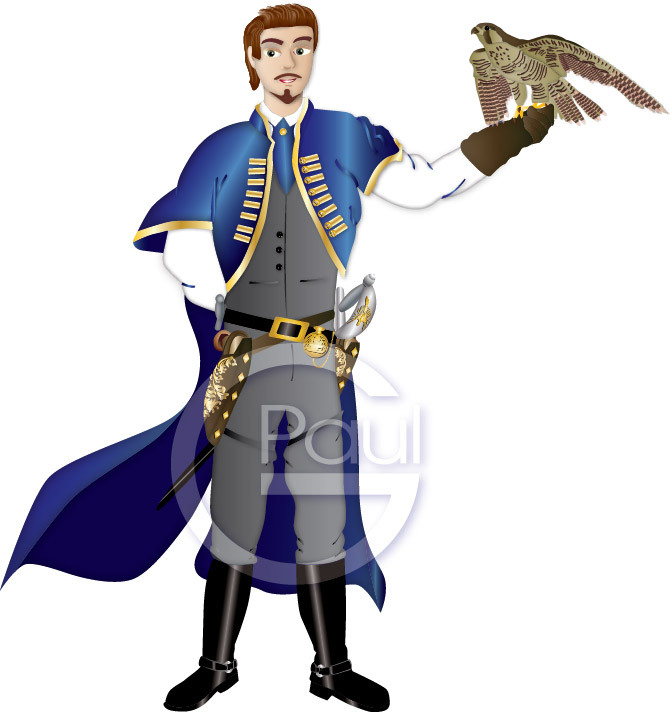 The only thing I added from the previous images of ‘The Captain’ is the out stretched arm with the caricature holding a falcon. Along the same lines as the idea of my caricature being the Maltese Falcon. The staff did not see this caricature until the final group portrait and they all loved it. Yet I did tell them that I did create this caricature as a character in a story I wrote. If you want to see and read the chapters I posted you can click on the link below. The eighteenth caricature is a wonderful teacher whom I have worked with on many occasions. She was working with the grade fives at the time and I wanted to create a Steampunk caricature for her as I drew caricatures of a few of the students in the graduating class. She always a straight arrow and speaks her mine on a number of topics. With this in mind I thought to draw her as a Steampunk archer. I never drew an archer before and I wanted something different for this caricature. I used the Lord of the Rings Elvin archers as inspiration and began there. I began with the corset and instead of a skirt or dress I drew her wearing skin-tight pants and riding boots. 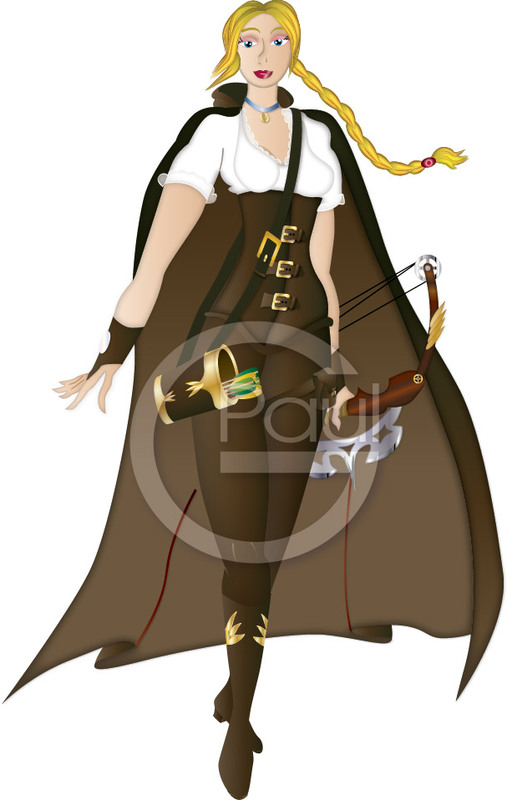 I added a feminine blouse with lace along the edge but because she is an archer she has short sleeves and a shooting gloves/greaves. Going with the Elvin archer look I drew her wearing a cape and hood. Her weapon of course is compound bow with a blade and a similar looking quiver. I then drew her hair with a large braid to finish the look. The seventeenth caricature is a wonderful teacher whom I have worked with on many occasions. She is a wonderful person to work with and has a … quirky personality on top of everything else, which is a good thing. This person has one place she loves to visit and she always talks about, Scotland. Therefore this is where I began when making her caricature. I began with a kilt and a tartan that I created. I then drew in the corset and large shirt that would show a bit of cleavage. I then added the belt, sporran, and black boots. I drew her hair a bit wild because that goes with her personality and then topped it off with a top hat and goggles. 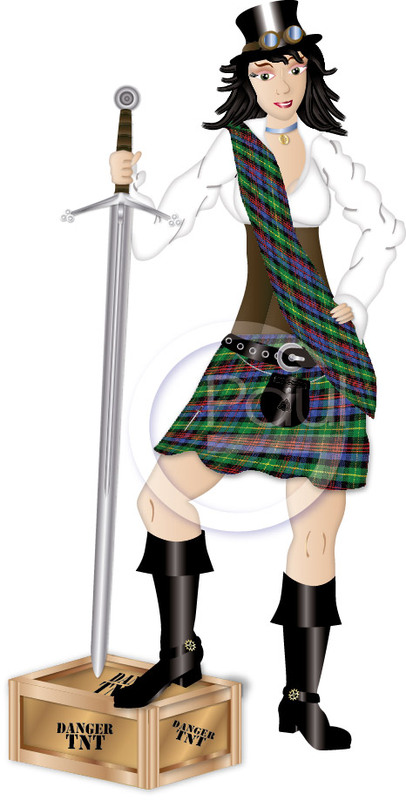 Then what Scottish outfit would be complete without a Scottish Claymore. Therefore I drew her holding one and stepping on top of a crate of TNT. If you look closely I added another claymore as a pin on her kilt. The sixteenth caricature is a wonderful teacher whom I have worked with on many occasions. She is a force to be reckoned with, and I wanted to show this with her caricature. I began with a corset and I drew it with extra leather straps/belts on it. But I wanted it to be part of a vest combo so I drew in the top part of the vest with collars. I then added an over sized white shirt similar to a pirate shirt. I wanted to show that she was a rebel therefore I drew her wearing pants and a large shotgun style rifle on a leg holster held there with a bullet belt. I then added a smaller side arm on the other side, leather boots and goggles in her hair.